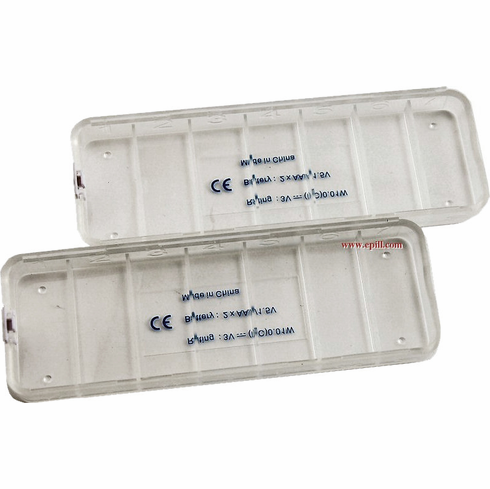 Order extra medication trays for your e-pill Multi-Alarm PLUS. Sold in two packs. By purchasing 3 sets (= 6 pill trays) along with the e-pill Multi-Alarm PLUS device your will have a great weekly pill organizer system. The Multi-Alarm PLUS is a practical system for organizing and remembering all your daily medications ("pills"). This accessory contains Two (2) Seven Compartment Pill TRAYS and a Two (2) clear LIDS. DOES NOT include electronic reminders. You may use the clear cover (included) or if an air tight seal is needed, we suggest using GLAD Press'n Seal® cut to the tray size. It will seal the tray to protect and contain medication. To order the complete e-pill Multi-Alarm PLUS System including Electronic Reminder: click here.